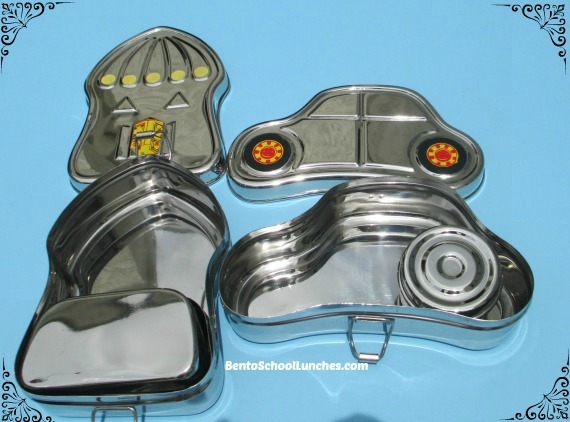 Happy Tiffin generously sent me two of their stainless steel bento boxes to review. 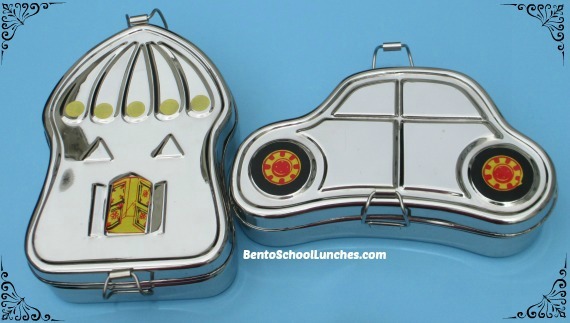 When I was given the chance to choose which one I preferred, I chose the 'Road Hog' and they pleasantly surprised me with an additional bento box, 'Happy Home'. Tiffin, a term popular mostly in India, refers generally to a lunch or small meal in a container intended for transport. Having grown up in a country of great cultural diversity, I remember my mother using the multi-tier version when going to visit friends or relatives and my grandmother using them to cater dinners for neighborhood families. 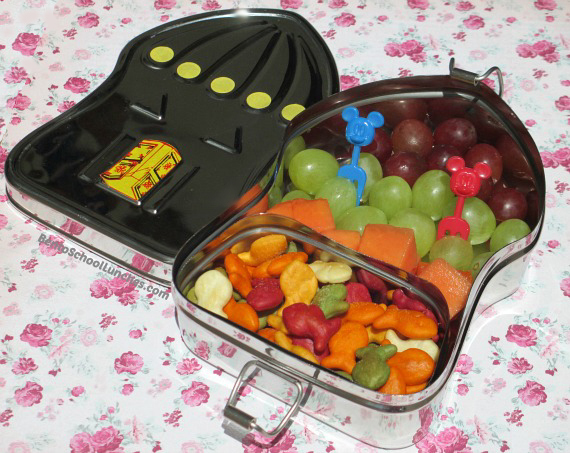 The 'Road Hog' or car shaped container is totally adorable! Made of stainless steel, it is durable, easy to clean, and shines. Of course its designed to do more than look nice, so it is also a convenient container 6.5 inches long, 4.5 inches wide and 2 inches deep. Inside there is the 'spare tire' a cylindrical container with its own lid, perfect for those foods you want to keep separate from the rest. The 'Happy Home' is 4.7 inches wide, 7 inches high and is also 2 inches deep, and every bit of it is simply adorable. Like the 'Road Hog' it also has a separate interior container and latches to secure the top. Both are dishwasher safe. - They are very cute! - Stainless steel will not retain stains, odors or residues. - Stainless steel will last for a long time with proper care. - Lead free, plastic free, BPA free, phthalate free and waste free. - The latches are quite secure, but could take a little practice. Our eight year old son experienced some difficulty opening it. To see other Happy Tiffins, visit their site here. Here are the Happy Tiffins which I received. Bears shaped onigiri with nori(seaweed) features. Leftovers meatloaf and broccoli florets. 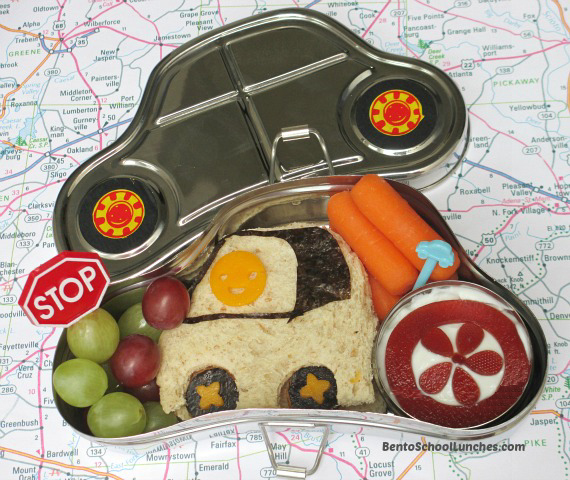 Here is a bento lunch in the Road Hog. Seedless red and green grapes. Car shaped sandwich using the lunch punch and accents are nori and cheddar cheese. Greek yogurt in the 'spare tire' with organic fruit leather. 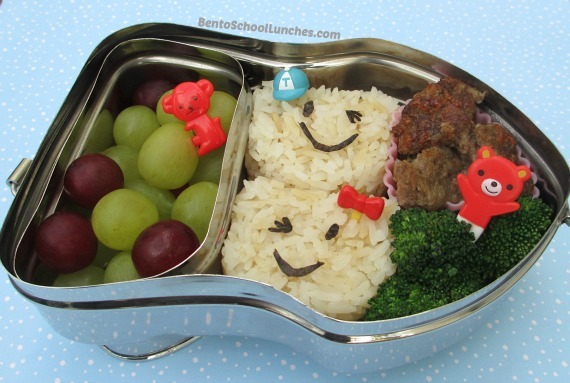 And here is a simple bento snack for after swim in the Happy Home. Papaya pieces, seedless red and green grapes. Disclosure: Happy Tiffin generously provided me with the products for review without cost to me. Other than receiving the products, I have not received any compensation to write this review. the boxes are so adorable!! I love the boxes and your lunch in the Road Hog is adorable!